His SFdigi debut, “Live Long Enough To Learn” (featuring appearances from Sage Francis, Slug of Atmosphere, Open Mike Eagle & more) drops November 16 on Digital Download – available at SFRstore, Bandcamp, iTunes, Amazon, Google Play, and on all streaming sites (including Spotify, Apple Music, YouTube Music, and Tidal)! You can also pre-order CDs (an individually hand-numbered run of 100!) and limited edition 7-Inch Lathe Cut Records of the first single “Do It Anyway” b/w “Figure ‘Em Out” (including an Instant MP3 Download of the FULL ALBUM) from SFRstore here. SEEZ MICS, the latest signee to Strange Famous Records’ digital imprint SFdigi, is a familiar name to followers of SFR. His history with the label goes back nearly 20 years (when he first hosted Sage Francis on his college radio show) and spans all the way to the most recent Epic Beard Men tour in early 2018, where Seez held down the opening slot on the group’s mid-Atlantic dates. A fixture in the long-overlooked DC/MD underground, Seez is regarded as one of the most underrated and well-respected lyricists and poets in the indie rap world. His body of work ranges from traditional hip hop (primarily from his long tenure as half of rap duo Educated Consumers) to progressive spoken word – and all facets of Seez’s verbal dexterity are on display in his latest work, Live Long Enough To Learn. Check out “Do It Anyway”, the first video from LLETL! Thanks to HipHopDX for hosting the world premiere! The respect and reputation earned by Seez during his decades around the industry is evidenced by the esteemed guests that appear on Live Long Enough To Learn: Sage turns in a verse on “The End Has Begun”, and indie rap legend Slug (of Atmosphere) and Open Mike Eagle fill out the unorthodox posse cut “Figure ‘Em Out.” Production on the album includes beats from SFR labelmates Prolyphic and Aupheus, longtime collaborator Max Bent, and underground hip hop favorites Ecid, Ardamus, and The Doppelgangaz. While he may opt for self-deprecation and humility in a business built on bravado and hubris, true heads (and the staff of the Strange Famous A&R department) are already wise to the razor-sharp skills and prodigious pen belonging to the emcee known as Seez Mics. Live Long Enough To Learn is the sum total of a rap life lived well, and is well worth a listen. And, you just might learn something before you’re through. These songs are the road to recovery on a journey that’s taken so LONG. 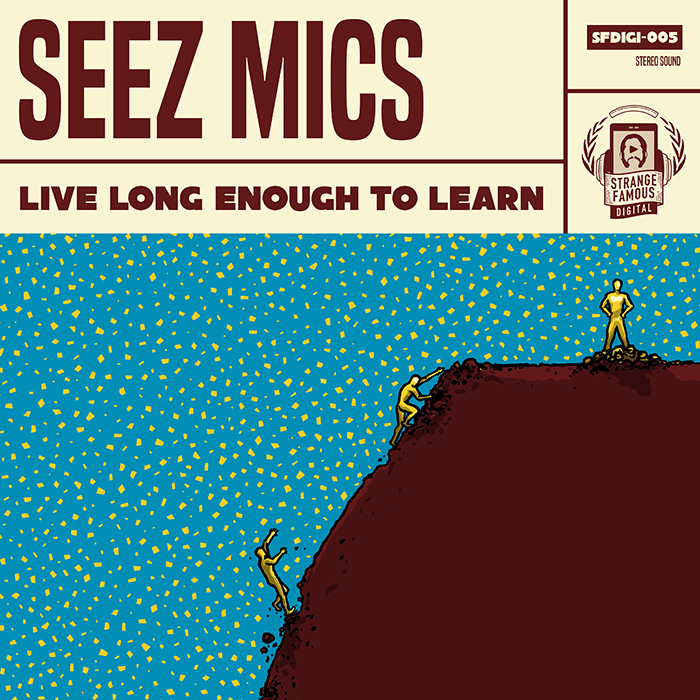 I first became aware of Seez Mics in 1999 when he did an interview with me on his college radio show. I still have a recording of that somewhere. It was just exciting that someone in DC was aware of my music and interested in talking to me about it. I then became more familiar with him after seeing him at Scribble Jam as he became one of the mainstays of that annual event. It’s odd to think of him being most known as a battle rapper back then, because I’ve never seen him be…mean. There’s a well contained fire in his lyrics, a measured and tempered approach to his delivery of them, and a very matter-of-fact manner in which he wraps everything up. That’s age and maturity at work, which isn’t often rewarded in the battle circuits nor in the music industry at large. We clearly aren’t “ageist” at Strange Famous Records. Mark it down. Heh. We’ve long been fans of the consistently dope output he had with his group Educated Consumers, so when it was time for his solo approach we were eager to jump on board and see what was possible. It took a couple years for everything to come together, but we’re finally releasing an official Seez Mics album and, as somber as some of the music is on this project, damn does it feel good. Maybe we should have waited until 2019 to release it and turn it into a 20 year anniversary of our music friendship, but nah…let’s go with this already. The fans have waited long enough.